This past weekend my husband and I had the honor of attending our friends’ absolutely stunning, rock star style wedding right outside NYC overlooking the water. We were very privileged to be asked to attend the bride in her pre-nuptial suite. 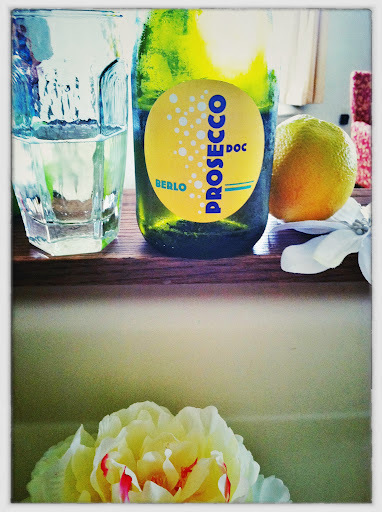 In addition to the chocolate with sea salt, smoked mozzarella and fruit, we brought along Berlo Prosecco. Since it was an Italian wedding, I thought it appropriate to enjoy an Italian sparkling wine rather than a Champagne. Berlo Prosecco is the product of the creative partnership of Casa Vinicola Botter Winery and New York wine importer Polaner Selections. Founded in 1928, Botter Wines produces over 10 different labels of wine, focusing on innovative production technologies and environmentally friendly practices in all of its vineyards throughout Italy. Pale golden yellow in colour, aromas of apple and minerals rose enthusiastically from the glass. Made in the frizzante style [semi-sparkling], light fruit flavours of summer apples and pear sparkled effortlessly in the fizzy body. Traces of honey and snappy ginger zipped about with the refreshing mineral acidity in the crisp finish. Friendly and fun, this is a wonderful bubbly for appetizers, desert, shellfish or any festive occasion.